At Seacoast Orthodontics, we can make a difference! Our office's #1 priority is to exceed your expectations during your orthodontic treatment. We utilize the newest technologies, including traditional braces, Invisalign® "invisible" braces, Invisalign Teen™, Incognito, children's braces and more. Advancements in orthodontics can mean shorter treatment time for you! Your orthodontists, Drs. Timothy Finelli and Jennifer Siller, will also develop an individualized treatment plan based on your specific orthodontic needs. Providing orthodontics for both children and adults, we recognize that each patient is unique and will help to develop your unique smile based on your specific goals. 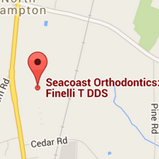 Providing quality orthodontics to North Hampton, Portsmouth, Rye, Exeter, and the Entire Seacoast and all surrounding New Hampshire areas.